← China’s New Climate Change Law: The pathway to a low carbon economy? 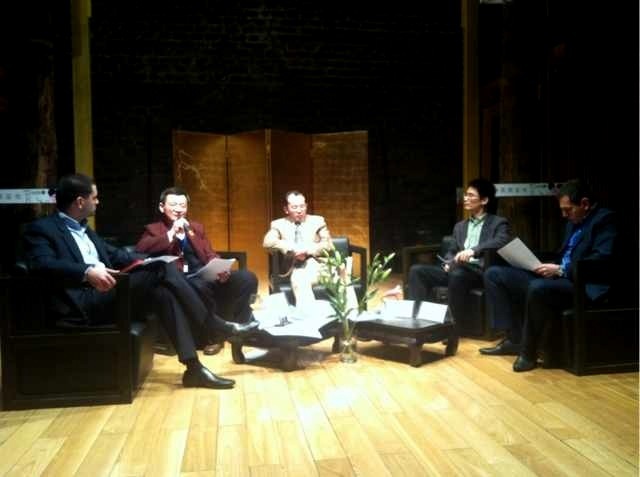 From Left: Mr. Renato Roldao (CCF) (Moderator), Mr. Xie Fei (China CDM Fund), Mr. Sun Guoshun (Ministry of Foreign Affairs), Mr. Qian Guoqiang (SinoCarbon Innovation & Investment), and Mr. Stuart Cerne (Enecore). It was considered important to be discussing the demand side of CDM at this point in time, after much previous discussion had been on improving the schemes’ operational infrastructure. Despite noted policy barriers, China is seen to have a unique opportunity to include CERs (Certified Emissions Reductions) in its pilot Emissions Trading System (ETS). With both domestic and international will, China could find solutions to these policy barriers. The purpose of this meeting, jointly held by China Carbon Forum and Sindicatum Sustainable Resources, was to discuss solutions to the challenges currently facing the Clean Development Mechanism (CDM), and in particular, the role China might play in this process. Key representatives from the Ministry of Foreign Affairs of the People’s Republic of China; China CDM Fund; Sino-Carbon Innovation & Investment; and Enecore joined the panel discussion. 60 participants from China’s climate change community joined in the audience. This meeting was also held at the same time the CDM Executive Board was meeting in Bonn to discuss these same challenges. All agreed it is important to discuss the future of CDM at this point in time. With the Kyoto Protocol signed for a second commitment period, now was the time to be discussing the challenges facing the CDM’s CER market, and to work through solutions. However, many uncertainties still lie over the CDM’s future, including: 1) future demand for CERs by developed countries, especially with countries such as the US and Canada still to ratify the Kyoto Protocol; and 2) What is the future of CDM after the second commitment period? It is unlikely that CDM will disappear within the international negation process. Similar mechanisms could be developed beyond the second commitment period, but this would also take time and these mechanisms should be based on the CDM. CDM is broadly considered an effective tool to link developing countries and developed countries to address climate change. CDM helps developed countries meet their emission limitation targets and developing countries get cleaner, more sustainable development. CDM has already produced clean energy equivalent MWh to the total power generation of Africa. In addition, many of the early design faults in the CDM have been remedied. The key now is to readjust CER demand/supply to a new equilibrium price. Some felt efforts to ensure the future of CDM were beyond the scope of China because it is a developing country, and this was important for developed countries to keep in mind. Yet others considered China to have a unique opportunity to develop CDM projects and purchase CERs through its pilot ETS’, and using the CERs from clean development projects in less developed parts of China through the existing CDM financial and operational infrastructure, especially because China is the largest beneficiary from the CDM. No other country currently has this opportunity in the market. The revenue from the sale of the CERs would in many cases be going back to state owned enterprises. Despite suggestions that China could absorb up to 600 million CERs by the year 2020, there appear to be two policy barriers for including CERs in China’s domestic ETS at present. First, at the international level, the definition of CDM is a project mechanism between developed and developing countries. So the CDM only enables developed countries to purchase CERs. Second, at the domestic level, the Chinese government may decide not to consider CERs as eligible offsets in its pilot ETS’, but to include only Chinese emission reduction credits (CCERs). Some felt that CERs generated in China would be absorbed by China’s pilot ETS’ in the future. However, it would be a considerable amount of time before CERs from other developing countries were purchased by China’s carbon markets. After observing China’s resolve to policy challenges in the past, it was considered that these policy barriers could be overcome. Would the new market mechanisms be better than the existing CDM? All agreed that the work in developing the CDM to-date should be respected when it comes to the articulation of new market mechanisms, and that it was inevitable that many aspects of the CDM, if not most, would be reflected in any new market based mechanism. Was there even a future for CDM? One opinion was that there might not be given the state of the EU ETS. From a business point of view, it is difficult to change the fundamentals of oversupply. On the other hand, the development of carbon markets is flourishing, so the opportunity for CER uptake can only grow. Projects in China scheduled for CDM could be transferred into CCERs. This could solve some of the supply side, but China’s pilots will take considerable time before the whole system is functioning properly and the validity and environmental integrity of CCERs is still under question. China has been the world’s largest beneficiary of the CDM and as a result of China’s progressive stance in developing and improving the CDM infrastructure, the development of ETS’ has been made easier in China. Can countries take on a higher portion of CER offsets in their ETSs (>10-15%)? It was thought important that policy makers understand this. Improving ambition in the CDM is about restoring investor confidence. One of the most important points for an efficient carbon market to be operationalized is setting the right cap. It was suggested that China is still at an early stage of rapid development and urbanisation, it would be very difficult to set an emissions cap and therefore difficult to have a strong carbon market. Outside the CDM framework, many countries only accept carbon offsets from their own domestic initiatives. From an economic point of view, offsets should be accepted at their lowest marginal cost, regardless of their origin. However, there are always political constraints to this argument. Would China be willing to support a CDM reserve which bought CERs when there was oversupply and sold when there was high demand? Some felt it was unlikely, and not aligned with the provisions of the Kyoto Protocol. With more ambitious caps, discussion about CER reserves could be avoided.